Traveling through a burned area can be dangerous. There are a wide variety of risks that you’ll need to manage. Don’t enter a burn area if it is closed to public access. Stay out of closed areas. After a wildfire, land managers may keep an area closed for weeks or even years because of falling rocks or burned trees that are in danger of falling across trails or into campsites. Do not enter an area before it is open. You don’t want to put search and rescue crews in danger. Sometimes, the trail can be obliterated by a fire. If a retaining wall has fallen down the mountain, you might find an impassable slope. It can take years to rebuild sections like that. Everything is looser than you think. Be safe. Photo by Terry Hill. Watch for falling trees. Even if the tree looks robust, it might be at risk of falling because of damaged root systems and fire-loosened soils. As the years pass, dead root systems rot and the likelihood of the tree falling increases. Watch for falling branches as well. Look up often. Take note of fire-weakened trees, snags and overhead dangling branches. Do not sit down and take a break under a fire-weakened or dead tree. Windy days are especially dangerous. Don’t go out in a burn area if it’s forecast to be windy. Leave the area immediately if the wind picks up and there are hazards around you. Don’t make camp below burned trees. Rainy weather is also dangerous. Wind often accompanies rain. And even if it’s just rainy, the chances of landslides and flash floods goes up. Water runs more quickly off the burned soil. And drainages can become clogged with trees, rocks, and debris. Debris can act like a dam, releasing a huge flash flood of water, mud, and debris that will destroy everything downstream. Travel through burn areas quickly. Minimize the risk you face by not lingering in dangerous places. Be extra cautious when choosing a campsite. Don’t camp in a risky area. 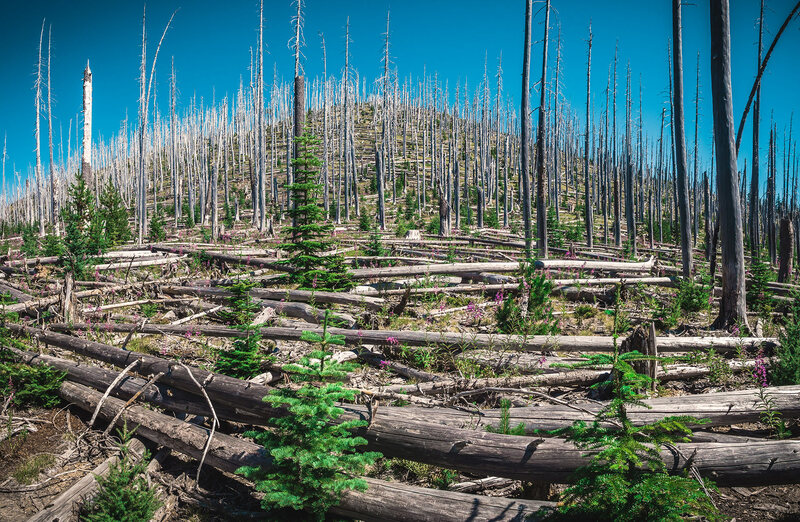 Look for dead trees that might fall toward your tent and steep slopes that could send rocks or landslides down on you. Don’t camp in natural swales or drainages because debris flows. Landslides and rock fall danger means you should be careful on hillsides. Stripped of its understory vegetation, burned soil is loose, so boulders, logs, and the soil can move. These dangers can increase as the freeze-thaw cycle loosens things up. On hillsides, if you encounter a downed log or pile of fallen rocks, go one person at a time in case the material shifts. Signs may have burned meaning you’re on your own when navigating. Bring maps and pay attention. The trail tread might be unstable, and it may collapse. Debris fallen from uphill can take out the trail tread. Trail retaining walls might be damaged and ready to fall down the mountain. Watch for burned-out holes in the ground. When stumps, root structures and duff burns, deep hollow cavities can be left below the trail surface. They may be invisible until your foot breaks through. These holes can keep burning for a long time after the rest of the fire is out. Notice white ash as it may be retaining extreme heat or be a sign of a potential sinkhole. 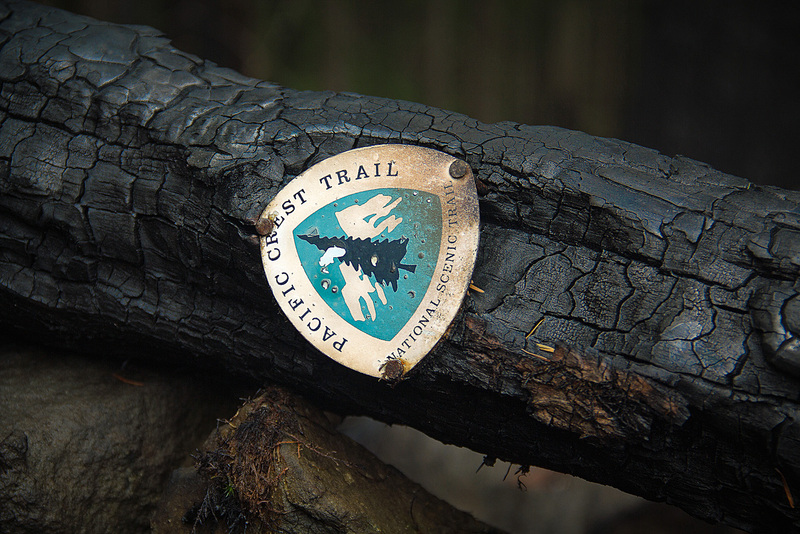 Stay on trails in burned areas. Be extra cautious when leaving the trail to go pee or poo, especially at night. Side trails may be impassable. The PCT might be reopened and maintained, but be cautious when taking side and connecting trails. Often, they are less frequently maintained. Watch for higher than normal stream flow, especially as the snow melts. Burned areas may melt snow more quickly, resulting in higher than normal flows where the trail crosses a stream. See something particularly dangerous? Report it. You wouldn’t want to camp here. Photo by Ryan Humes.